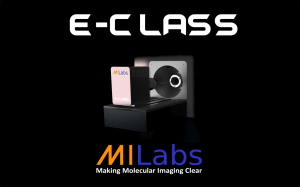 MIlabs introduces the E-Class line of preclinical imaging systems. Continuing its customer-centric approach, and fulfilling its commitment to providing preclinical imaging systems of unmatched price/performance, MILabs has introduced its E-Class of tomographic imaging products. The E-Class imagers were specifically designed for ambitious researchers to start their research now, and who want the option to easily upgrade the same system in the future. The E-Class systems were developed using the same advanced imaging technologies as the industry-leading VECTor system, and refined for lower cost and easy scalability. Dr. Beekman added, “The E-Class systems were built for the future needs of researchers, so they can start small, think big and scale fast”.